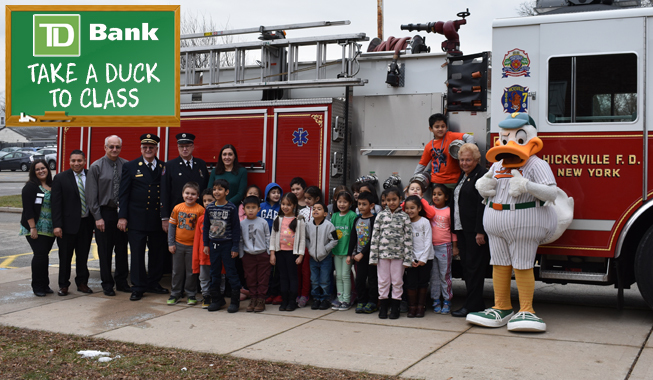 (Hicksville, N.Y., Jan. 18, 2019) – The Long Island Ducks spent Friday afternoon at Lee Avenue Elementary School in Hicksville as part of their TD Bank “Take a Duck to Class” visits. First grade student Harman Deep Singh was honored for being one of four lucky winners across Long Island in the annual essay contest. Harman wrote a superb essay in which he detailed how firefighters were “heroes in his community.” At a school assembly attended by over 400 students and school principal Ms. Stephanie Stam, the winning essay was read aloud in front of members of the Hicksville Fire Department. Along with the firefighters, Town of Oyster Bay Councilwoman Rose Walker was also at the school for the festivities and spoke to the students. A $50 gift card was presented to Harman by Heleyson Giron, TD Bank Hicksville Store Manager/Vice President. Long Island Ducks mascot, QuackerJack, celebrated Harman’s winning essay at the school as well. The lovable mascot presented Harman with a ticket voucher the Ducks Opening Weekend Fireworks game on May 4th so that he can have a fun night at the ballpark with his family. Harman then invited the Ducks back to his classroom for a private autograph session with QuackerJack. His teacher, Mrs. Theresa Franz, got to see her class all receive special gift bags, courtesy of TD Bank, for Harman’s outstanding work. The class also had the opportunity to see the Hicksville Fire Department truck up close.